CRAZY DISCOUNT! Was: $369.95 Now: $199.95! This inversion table is a great way to increase flexibility and reduce stress and tension on your body at the comfort of your own home. 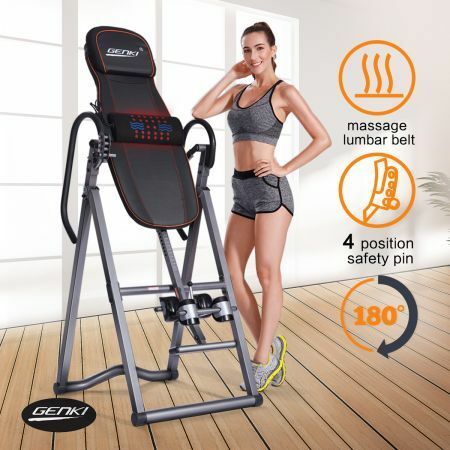 Featuring a waterproof PVC mat, an adjustable headrest and padded backrest, this back inverter is comfortable enough for daily exercise and massage therapy. The combined heating massage belt makes the inverter table for sale one of the most advanced inversion tables on the market to date. This inverter table for sale with 4 adjustable level is able to securely turn you upside down at your preferred degree. An adjustable boom (from 147cm to 198cm) can easily accommodate the height of the user. The heel/ankle holders (PE foam rollers and u-shape holders) of the cheap inversion table provide extra comfort while hanging upside down. And the softly padded u-frame handles give you a hand to return to an upright position. Made of heavy duty and durable steel tubing, this inversion table australia can support a maximum weight of 150kg. A set of non-slip feet guarantee your stability and safety. This new inversion table is right for you, for it looks as good as it operates. You surly will love it. Note: Before using this equipment, you should consult with your personal physician to see if inversion equipment is appropriate for you.